This week I am introducing a new feature. In addition to my weekly (Wednesday) posting, I am going to post a weekly Bible verse and commentary each Sabbath (Saturday). These verses will be chosen at random or will fit the season. I’ll try to keep from going too deep. I hope you gain some knowledge and inspiration from this process. My goal is to educate myself and share with everyone. The verses will be presented from the King James and New International Versions and commentaries will be from various sources and will always be attributed to the source. My first verse in this series is one of the fundamental verses in the Bible. It’s actually 2 verses, Exodus 20:8-9. These verses are from the Ten Commandments, and are actually the 4th Commandment. God gave these commandments to us, through Moses, on Mount Sanai about 2500 years after Creation. In the 4th commandment, God uses the word remember in relation to the Sabbath. 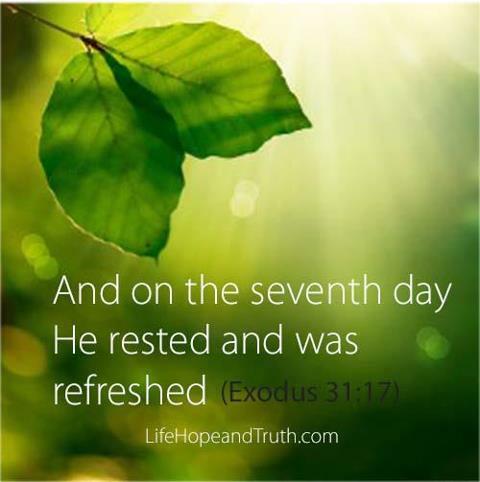 This tells us that the Sabbath was already in place. Since God never changes, as Malachi 3:6 tells us, the Sabbath must still be in place today. Sunday keeping began when Emperor Constantine made a declaration enforcing Sunday worship in 321AD. The law was confirmed by the Papacy in 364AD. The Sunday law is man-made and does not contain any spiritual or Biblical reference.